Before there was Osama bin Laden there was Ayatollah Khomeini, a radical Muslim leader who challenged the world's "infidels" in the name of Allah. 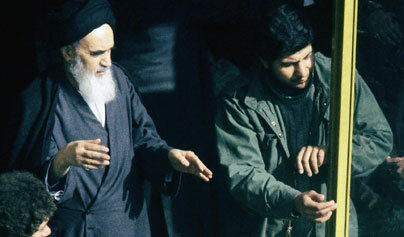 After his father was killed by bandits, the young Khomeini was brought up by his mother and aunt. However, when he was only fifteen he suffered further loss as his aunt died and then shortly afterwards his mother also passed away. Under the guidance of his elder brother he learnt Islamic science, literature, and philosophy, eventually becoming a leading authority on theological law. In 1962 he became politically active and openly protested against the torturing and imprisonment of the people by the Shah of Iran, whose regime was seen to be safeguarding the interests of the US. On June 3 1963, Khomeini made a historic speech against the dependence of the Shah’s regime on foreign powers, and its support of Israel. He was immediately arrested, but his imprisonment inspired major public demonstrations of support, that were eventually crushed by government troops in tanks. Then in November 1964, he was arrested for a second time, and sent into exile, first to Turkey and then to Iraq, where for fifteen years Khomeini wrote and lectured against the regime in his homeland. Khomeini continued his outspoken denunciations, developing a strong religious and political following abroad, until forced to leave Iraq in 1978 by Saddam Hussein, he then moved to France. After the Iranian government had been overthrown by an Islamic revolution in 1979, and the Shah sent into exile, Khomeini returned to Iran, declared an Islamic republic, and began to exercise ultimate authority in the nation. He was enthusiastically greeted by the people. In response to the exiled Shah's admission to the United States in September 1979, a large crowd seized the US embassy in Tehran, taking 52 American citizens hostage. In time, Ayatollah Khomeini's inspiration would lead to coups, terrorist bombings, hijackings and assaults against a demonised West. For some faithful Muslims, his rise became the inspiration for political rebirth.